You could forgive Sydney FC for not counting down to the start of 2018 with much enthusiasm. For the Sky Blues, 2017 was as close to perfection as any club could have hoped. Of the three titles on offer, they won all three. Of the 105 points available to them in the league, they collected 91. By May, they had set new records for most points in a season, fewest conceded, biggest goal difference, biggest winning margin for a premier and most wins in a season. 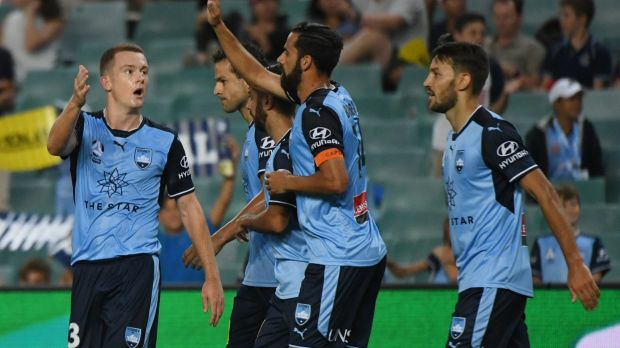 After their 6-0 win over Perth Glory on December 30 at Allianz Stadium, Sydney FC had registered their last of the year - setting a new A-League record for the most goals scored in a calendar year. There's no shortage of optimism for Sydney FC heading into 2018, given their commanding eight-point lead at the top of the table. And the club believes Saturday night's impressive demolition of Perth Glory has laid the foundations for the next 12 months. In one of the most dominant 45 minutes of attacking football under the tenure of Graham Arnold, Sydney FC scored five goals against a hapless Perth Glory in a performance that is now the Sky Blues' benchmark for 2018. "Our second half was amazing and I expect to play this every game, for 90 minutes," Sydney FC midfielder Adrian Mierzejewski said. Sydney FC were ruthless in front of goal, and could have had another three or four had it not been for a fine performance from Perth goalkeeper Liam Reddy. After winning several games early in the season by slender margins while seemingly not at their best, the Sky Blues have shown over the past month just how potent they can bew when in full stride. But with 18 goals in their past four games, Sydney FC are the form scorers heading into the new year and are confident they can maintain their eye for goal in the second half of the season. Field day: Brandon O'? ?Neill gets in on the act and is congratulated by skipper Alex Brosque. Photo: AAP "We have to think for ourselves to play like the second half against Perth," Mierzejewski said. "I am very happy I have joined the team and we just lost one game against Central Coast and 1-0 and one draw and I didn't play these two games which I'm pretty because every game which I've played for Sydney FC I have won so this is very, very positive. "Every game we have to try and play our best football. Every game depends on us. If it's not our day, we can 1-0, 2-1, 3-2. But if we have our day, we can kill every team. I think from February will be more difficult because we will have more games [with the Asian Champions League] and we have to think about every next game." Mierzejewski was named man of the match in Sydney's defeat of Perth after scoring one goal, setting up another and playing a key role in two others in the 6-0 win. He scored his seventh goal in eight games but his coach believes the former Poland international is not yet playing at his potential. "From what I saw on footage, video and research on Adrian, he still has got so much more," Arnold said. "He's still trying to get used to the physicality of the league, he's still trying to get used to the pace of the league." You could forgive Sydney FC for not counting down to the start of 2018 with much enthusiasm. For the Sky Blues, 2017 was as close to perfection as any club could have hoped. Of the three titles on offer, they won all three. Of the 105 points available to them in the league, they collected 91. By May, they had set new records for most points in a season, fewest conceded, biggest goal difference, biggest winning margin for a premier and most wins in a season. After their 6-0 win over Perth Glory on December 30 at Allianz Stadium, Sydney FC had registered their last of the year - setting a new A-League record for the most goals scored in a calendar year. There's no shortage of optimism for Sydney FC heading into 2018, given their commanding eight-point lead at the top of the table. And the club believes Saturday night's impressive demolition of Perth Glory has laid the foundations for the next 12 months. In one of the most dominant 45 minutes of attacking football under the tenure of Graham Arnold, Sydney FC scored five goals against a hapless Perth Glory in a performance that is now the Sky Blues' benchmark for 2018. "Our second half was amazing and I expect to play this every game, for 90 minutes," Sydney FC midfielder Adrian Mierzejewski said. Sydney FC were ruthless in front of goal, and could have had another three or four had it not been for a fine performance from Perth goalkeeper Liam Reddy. After winning several games early in the season by slender margins while seemingly not at their best, the Sky Blues have shown over the past month just how potent they can bew when in full stride. But with 18 goals in their past four games, Sydney FC are the form scorers heading into the new year and are confident they can maintain their eye for goal in the second half of the season. "We have to think for ourselves to play like the second half against Perth," Mierzejewski said. "I am very happy I have joined the team and we just lost one game against Central Coast and 1-0 and one draw and I didn't play these two games which I'm pretty because every game which I've played for Sydney FC I have won so this is very, very positive. "Every game we have to try and play our best football. Every game depends on us. If it's not our day, we can 1-0, 2-1, 3-2. But if we have our day, we can kill every team. I think from February will be more difficult because we will have more games [with the Asian Champions League] and we have to think about every next game." Mierzejewski was named man of the match in Sydney's defeat of Perth after scoring one goal, setting up another and playing a key role in two others in the 6-0 win. He scored his seventh goal in eight games but his coach believes the former Poland international is not yet playing at his potential. "From what I saw on footage, video and research on Adrian, he still has got so much more," Arnold said. "He's still trying to get used to the physicality of the league, he's still trying to get used to the pace of the league." This story Sydney FC set one last record for 2017 to set themselves up for 2018 first appeared on The Sydney Morning Herald.